As I recently crossed my two year mark of my journey taking on the furniture industry, I have decided to blog about the trendy tidbits, fashion, quality, construction and everything else that makes this industry truly amazing. Here is a brief history of my life and how I got started in furniture. I was born into a family of merchants. 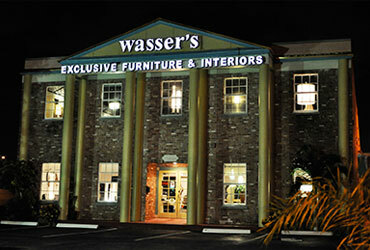 My grandfather (z''l) went from manufacturing kitchen tables and chairs to retail where he and my dad originally owned and operated Lee Furniture in Scranton, PA. Later in life, they relocated to the lovely south Florida where they established wasser's exlusive furniture & interiors in the 80's. I was raised with flipping over chairs in restaurants, picking up cushions in hotel lobbies and taught to really "sit your tuchus" in a sofa or sectional to know if the construction was up to par... AKA constructed with 8-way hand tied coil springs. Wherever I go or whatever movie or tv show I watch, I notice the furniture first. I was always interested in being involved but never thought I would end up in the business. I have traveled to many furniture markets with my dad and brother over the past years, prior to being a part of the business. I was able to put my two cents in (for whatever they were worth) and tried to contribute a woman's perspective as a quasi-buyer for wasser's furniture with only one foot in the door until a little over two years ago. High Point Market with dad, the man who taught me everything I know about furniture! It was known I always had a passion for the fashion world, ever since I was a little girl and I always wanted to bring that into my career through business and merge the two together somehow. It was not until I was in a showroom at market one year where I was asked "So Jaime, why are you not in the business with your family?" My response was, "Well, I always wanted to do fashion, so that is what I am doing!" Their comeback, "Look around.. Furniture IS fashion!!!" Exposed zippers, glamourous leathers over down feathers, exquisite design. THIS is Fashion! It was just then.. I saw it. I was there, in one of the most beautifully decked out, fashionably inspired and detailed furniture showrooms, trying to prove a point that I wanted to do fashion and it hit me...My A-ha... eye-opening moment that was sure to come over me one day, I was surrounded by fashion. All the years of my dad saying.. "When you are ready, I will build you an office..." I was finally ready to make the leap and it was the best decision I ever made. I initially learned the basics of fashion working at The Gap in my early years, majored in business & marketing at UCF, interned at Fox and was mentored by Yossi Katzav, who at the time was design director of Fox mens at their corporate headquarters in Israel and now has his own clothing line SKETCH. I have to thank Yossi for taking me under his wing when no one else wanted an english speaking intern. Yossi, you really encouraged me to explore the passion of fashion inside me, putting aside all language barriers, I took away so much from my experience with you. I then learned the essence of combining business, fashion and merchandising at the wholesale level in my years at Perry Ellis corporate. As destiny would have it, I was fortunate to come full circle and join the family business with my father and brother and continue the legacy of what used to be the industry of glit, hardwoods and borax in my grandfathers day and to what has now evolved to glitter (swarovski, of course), lacquer, exotic marbles and luxurious leather goods. I hope to be able to reach out to a wide variety of readers, to educate, inspire, motivate, and engage in all topics of the haute furniture world I live in. Leave it up to my daughter. 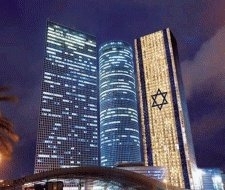 Such a great blog......lots of mazel ! Good on you Jaime... thanks for your lovely comments about my blog tips!! So glad you are finding them helpful.